Home ssc notice Recruitment of Sub-Inspectors in Delhi Police, CAPFs and Assistant Sub-Inspectors in CISF Examination, 2017 - Declaration of Medical Examination Result for short listing candidates for Document Verification. 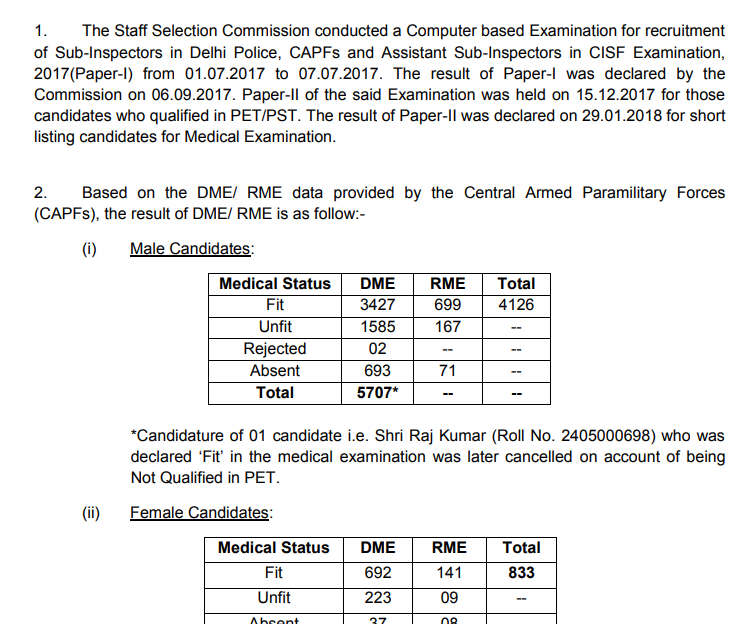 Recruitment of Sub-Inspectors in Delhi Police, CAPFs and Assistant Sub-Inspectors in CISF Examination, 2017 - Declaration of Medical Examination Result for short listing candidates for Document Verification. The Staff Selection Commission conducted a Computer based Examination for recruitment of Sub-Inspectors in Delhi Police, CAPFs and Assistant Sub-Inspectors in CISF Examination, 2017(Paper-I) from 01.07.2017 to 07.07.2017. The result of Paper-I was declared by the Commission on 06.09.2017. Paper-II of the said Examination was held on 15.12.2017 for those candidates who qualified in PET/PST. The result of Paper-II was declared on 29.01.2018 for short listing candidates for Medical Examination. Appointment of caretaker in the pay matrix-5(old pay band PB-1 of RS. 5200-20200/- with the grade pay of rs 2800/-) in the headquarters of staff selection commission, new delhi on deputation basis.